Sounds of Cape Cod Fishes. Rodney A. Rountree, PhD., Department of Natural Resource Conservation, UMASS-Amherst, http://www.fishecology.org. Did you know that fishes make sounds? In fact, over 150 species on the East Coast of the U.S. can vocalize. And that's likely to be a vast underestimate, because few scientists have attempted to study fish sounds in our temperate coastal waters. Did you know that many fishes, right here on Cape Cod are highly vocal (see list in Table 1)? In this demonstration you will get to hear the sounds of just a few of the vocal species on Cape Cod (see illustrations below). Table 1. Partial list of species known to be capable of sound production based on field and/or laboratory studies, and which occur at least seasonally in New England (Long Island to Maine) estuarine and shelf waters (Fish et al. 1952, Fish and Mowbray 1970, Hawkins and Rasmussen 1978, Tavolga 1980, Mann et al. 1997). *Sound production capability assumed based on the presence of anatomical structures usually associated with vocalization. Primary target species are shown in bold type. Click on the fish illustration to hear an example of its sound. Sounds of haddock spawning in the National Marine Fisheries Service brood stock tank at Narragansett, RI recorded by Tom Halavik about 1970. Click here for an example of another haddock sound produced at the latter stages of courtship. The haddock is an important commercial species in New England. It, like its close relative the Atlantic cod, is highly vocal. Cod and haddock vocalize primarily during the spawning season, when males set up temporary territories and defend them against rival males. Females are attracted by the male's call. Both species, like most gadids (cod fishes and hakes), have a large highly specialized "sonic" muscle that they use to drum against the swim bladder to produce a "thumping" or drumming sound (Figure 1). Work by Tony Hawkins and his colleagues in Europe have shown that haddock have a complex vocal behavior pattern that can be used to identify specific stages of courtship (Fig. 2). Figure 1. 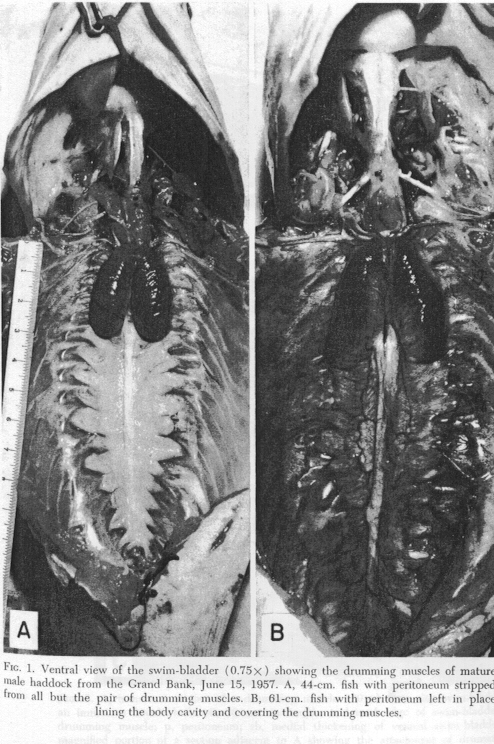 Haddock sonic muscles (from Templeman and Hodder 1958). Figure 2. Illustration of courtship and spawning behavior of haddock. 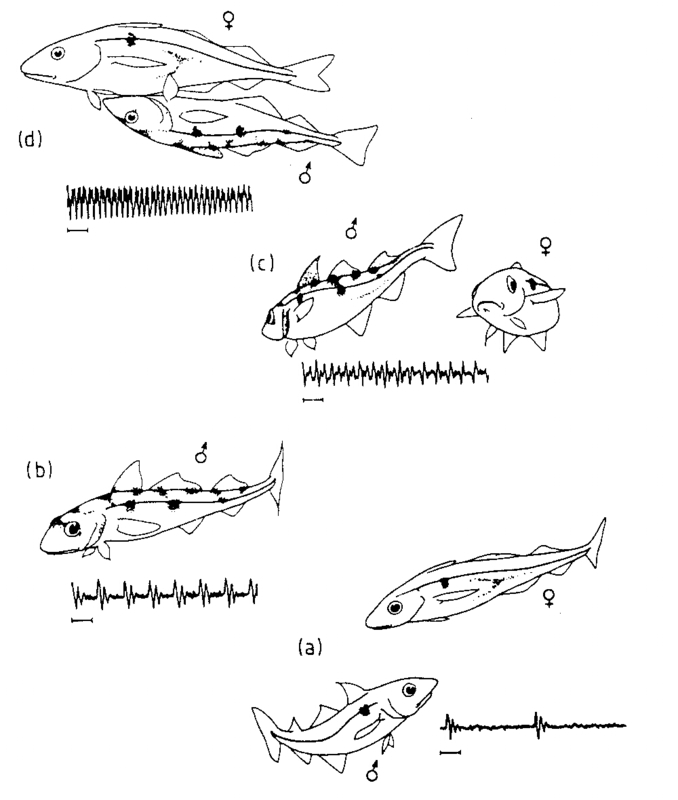 Each stage of the courtship display is characterized by a different sound pattern (Illustration from Hawkins 1986). The striped cusk-eel is a highly vocal species thought to occur from New York to Florida. However, my recent work on Cape Cod reveals that this species is also very abundant in our estuarine and coastal waters. In fact, it is very abundant right here in the Waquoit Reserve. Cusk-eels are nocturnal and only come out of their burrows at night. Male cusk-eels set up a loud chorus at sunset during the summer to attract females for mating. They spawn nearly every night, with the female laying a small clutch of eggs in a gelatinous mass that looks just like a Ctenophore (comb jelly). Figure 3. 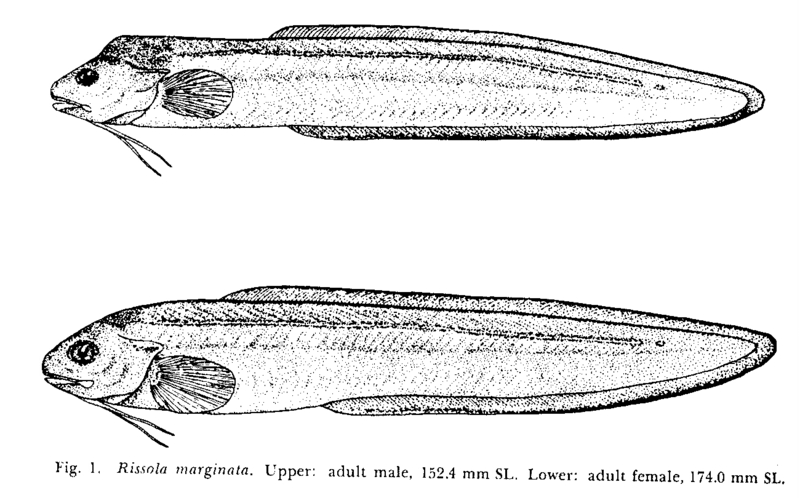 Illustration of male and female striped cusk-eels, Ophidion marginatum (adapted from Courtenay 1971). The crevalle jack is a summer visitor to Cape Cod. The juveniles grow rapidly during the summer and migrate south in the fall. This species is highly vocal, and fishers often hear it protesting loudly when caught by hook-n-line. Little is known of its vocal behavior. The weakfish is a prized gamefish from New England to Florida. It is a member of the large family of "drum" fishes (Sciaenidae) which are important fishery species, especially in the south. Like most of the drum fishes, the weakfish is highly vocal and produces vigorous croaking sounds when threatened and during spawning. 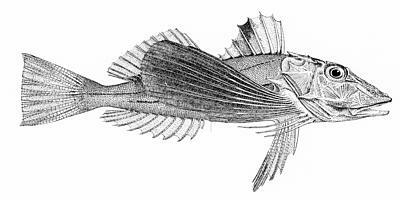 The striped searobin and its cousin the northern searobin are prolific sound producers. Have you ever caught one while fishing, only to hear it loudly yelling for its freedom? Little is known about this abundant and beautiful fish. The longhorn sculpin produces a quite, but obvious sound when handled. Commercial fishers call it the "buzz bomber" because it buzzes and vibrates in your hand when held. Little is known about the vocal behavior of this abundant northern fish. Until recently no one even knew how the fish produced its sound! The northern puffer is unusual in many ways. The kids will love its distinctive sound! It also occurs from Cape Cod to Florida. Unfortunately, nothing is known about its vocal behavior. The oyster toadfish is perhaps the best studied vocal fish in the world, however, still little is know about its vocal behavior in the natural world. The toadfish is thought to make two types of calls. A grunting sound when frightened or aggressive, and a "boatwhistle" sound. The boatwhistle sound is very distinctive and can be heard often in the early evening hours of the late spring and summer from Cape Cod to the Florida Keys. Interestingly, although the boatwhistle sound has been attributed to the toadfish for many years, it has never been observed in captivity! Its function is thought to be to call females to the male's nest, but further work is necessary to confirm this hypothesis. Why should scientists, and YOU for that matter, care about fish sounds?